NEW: CLICK HERE for UPDATED Memorygrabber Page! NEW: Memorygrabber has a NEW updated 2013 version. DID YOU KNOW? Each day, 10,000 more Baby-Boomers turn age 62 and many of them are leaving a record of their lives for their children. Are you ready to do the same? It is now 2011! Don't let another year go by without writing your autobiography or learning how to write an autobiography for a dear parent, grandparent or friend. ...It's never been easier for you than now with Memorygrabber. 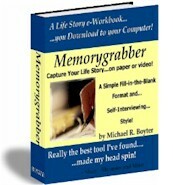 Learn how to write an autobiography with Memorygrabber as your guide. Get a quick start writing an autobiography. Memorygrabber quickly downloads to your computer and arms you with a 248 page "arsenal" of memory grabbing questions, topics, activities, games, Web resources, lists-to-create and more! Whoever said that writing an autobiography had to be hard and boring? Memorygrabber will walk you through, step by step, and show you how to get started by building a personal life timeline and conduct a family history interview with parents, grandparents and others. Memorygrabber makes preserving one's life story as simple as filling in the answers or reading and answering your responses onto audio or video tape. Memorygrabber will prompt you to consider and preserve at least 900 things that your kids and grandkids will want to know about your life someday, but won't think to ask until it's too late. Come on and admit it. How many of these things have you told yourself? What is keeping you from starting? ...the result is the same. You live a great life, but in the end, you neither write or preserve a thing. How many generations do you think it will take before your family forgets your name? Ask most any person to tell you what they know about their great-grandparents and there, I believe, you'd have your answer. There is hardly a better way to spend quality time with family or a close friend, than talking and sharing good times and memories from yesteryear. If you decide to record your answers, rather than writing them, sitting down with another individual, that you trust, will make it much easier. It's hard sitting alone and recording your voice. But with a trusted individual there, it's much easier to have a true, more natural flowing recording of your answers. Help your friend with his or her life story, while you are at it. You just might learn more about each other. Questions! So many memory-sparking questions and nobody more qualified to answer them than you! With as much such a 600 questions, you'll never have to stare at a blank page and wonder what to write about. Let Memorygrabber's huge arsenal of inquisitive questions walk you back through your life, year by year. Lists! This is, by far, my favorite section of the e-book.List your first... List your favorite... List your topten... Describing your life through list-making requires very little writing skill, yet they can say so much about your life. If you are one who thinks that you haven't much to tell about, this part of Memorygrabber will, literally, change your thinking on that. From listing all your favorite things to topics like "List the Risks that you Regret not Taking", you'll be surprised at all the memories that come back to you. There are many other life lists for you to build, but I can't divulge them all right here! Just make sure you have a sharp pencil ready! Activities! ...Have fun and get the rest of the family involved with 14 Memorygrabber "Rapid-Recall" activities. Each one is designed to assist in recollecting times past, through involvement of other family members. From setting up and playing a "Family Trivia Game" to crafting hang-on-the-wall "Life Timelines", you'll re-discover personal and family history moments that you'll be anxious to share with your children. ...Some pretty amazing Web resources that'll send you on a trip down memory lane. Addictive! Once you begin you won't want to stop. You'll really get the job done this time! Provide the avid life story writer additional ideas they may never would have thought of on their own! Focus on "doing" rather than just reading "how"
Be motivating enough to cause procrastinators to jump right in and do it! Prove that everyone's life story is exciting enough to preserve! Capitalize on the power of the web--Web resources that only an e-book can provide! Included with your order of Memorygrabber will be our exclusive "Quick Journal Template". Ever felt guilty for not writing in your nightly journal/diary because you were tired and couldn't think of much to write about anyway? Say good by to that problem when you get our simple "Quick Journal Template". This consists of a page and a half of quick fill-in questions that will make recording your daily happenings quick and simple. "I'm reading..." etc... are just a few of the 20 questions contained in this journaling template. All 20 quick questions are designed to record the days events with minimal effort. Never again put off writing a daily accounting of your life in a journal/diary because you can't think of much that you did in the day or you don't believe you have the time. Now, you'll have the "Quick Journal Template" to remind you. Declare Proudly, "This is Who I Am"
One fills out a job application to let their potential employer know all he/she needs to know about them. Memorygrabber is much like a "job application", if job applications were 248 pages long. The only difference is that this is for your family. Now if this sounds like some work, you'd be correct. But, at the same time, no one has ever complained about writers block, while filling out a job application. Memorygrabber is unique in its "Whole Person" concept of life story preservation! You, the unique person that you are, consist of more than just your past. In fact, if you think about it, your past is only one third of who you are. The other two parts consist of who you are today, as well as who you hope to be in the future...in other words, your hopes and dreams for the future. Who you are today and who you hope to be in the future are all part of the "Whole Person" concept that Memorygrabber tackles with a vengeance! "This is who I am..."
"This is what I believe and think about things in life..."
"These are world events that shaped my life and generation..."
"This is what I plan and hope to do with the rest of my life..."
"These are people (family and friends) that have and still do have impact in my life...and so on!" DOWNLOAD your copy of Memorygrabber in the next few minutes and get your life story off to a great start before you even go to bed tonight! Introducing a New Standard in Life Story Workbooks! Memorygrabber isn't your standard "Write your autobiography" book, where you get a pretty picture book with one or two questions per page, followed by a blank page for your answer. What good would that do you? ...Instead Memorygrabber is tightly packed and full of enough memory-grabbing ideas, that you'll never run out of memories to preserve. Nearly all pages, within Memorygrabber, are full of questions or other things to do and complete. All downloadable books are commonly referred to as e-books. E-Books are very popular on the Internet and their popularity looks to continue sky-rocketing into the future. Even Amazon.com has set up their own e-book division...so that should tell you something right there. E-books, like Memorygrabber, are available for you to download and access 365 days a year, 24 hours a day. It doesn't matter if you live in New York or New Zealand...or even whether I am asleep when you order it, for that matter! E-Books are cheaper to produce and this savings is past on to you! E-books are easily updated, ensuring you that the information is fresh. Ever picked up a real old book at the library and wondered if the information in it still applied? E-Books are linkable to the Web Memorygrabber has more than 30 Web Links included. You'll be just a click away from tons of information that will bring memories come flooding back to you and more.These links will connect you with, among other things, large databases of information from the past. A virtual walk down memory lane. After putting in hundreds of hours into Memorygrabber, it has been a great joy and uplift to me to receive so many compliments and words of support from those who have purchased Memorygrabber from all around the world. ...you don't have to take their word for it! Memorygrabber comes with a lifetime satisfaction guarantee. If you determine that Memorygrabber will not be of worth to you or your family, simply ask for a full refund...I'll promptly get it back to you.